This mid-rise residential condominium building is one of the most distinctive along the High Line in Chelsea. It is distinguished by its façades of randomly stamped stainless steel panels with a faceted diamond pattern and tinted, fritted and clear glass and its unusual window patterns somewhat resemble a crossword puzzle. The panelized system of semi-reflective stainless steel are designed to appear like the graduated shades of gray within clouds, conjuring, according to Della Valle Bernheimer, the project s architects, abstract images of steam clouds from locomotives that used to run on the High Line. The basic plan of the 11-story building is of two rectangles that are perpendicular to one another but share a small part of an edge of each. 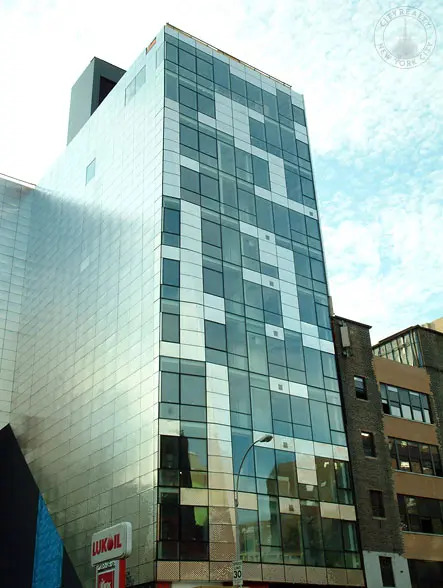 The architectural form of 245 Tenth Avenue is further complicated by the fact that the building bulges outward at a slight angle near its base. Grasso Holdings, whose other projects in the city include 50 Pine Street and 124 West 24th Street, was the developer of the 20-unit project. The building has a full-time doorman, a residents' terrace and lounge overlooking the High Line, private basement storage, and Abigail Michaels concierge service. Apartments have recessed track lighting on exposed concrete ceilings, keyed entry/elevator access, 9-foot-8-inch-high ceilings, ebonized oak flooring, individual air-conditioning, Lualdi frameless doors of ebonized oak and lacquer with stainless steel hardware, building-wide chilled water, stainless steel radiator covers, and Bosch washers and dryers. Kitchens have recessed lighting, stainless steel countertops, RIFRA fixtures and cabinetry designed by Della Valle Bernheimer including cantilevered sinks and mirrored medicine cabinet doors that lift upwards, Sub-Zero refrigerators, Thermador ovens and cooktops, and Bosch dishwashers. Bathrooms will have Inca grey slab flooring and tiles in showers, radiant floor heating, Toto commodes, RIFRA fixtures, and Corian tubs. The two penthouse units have wood-burning fireplaces, 10-foot-6-inch-high ceilings, double Thermador ovens, Gaggenau cooktops, Ipe wood decking, private outdoor showers and Sub-Zero Refrigerators. One will have 1,450 square feet of exterior space and the other 1,850. The building's mid-block entrance on Tenth Avenue is next to a angled chamfered corner at the south.